« Vive la differenza!–Vive la difference! I bought some impressive looking fennel at the organic market. It sat on the kitchen island demanding attention. It was tenderly crunchy–not in the least stringy. 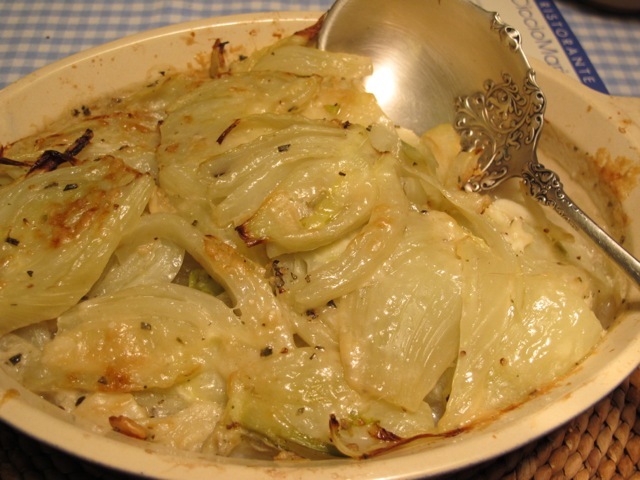 Fennel gratin I thought–supper with a sweet potato and tarator sauce. I’d never cooked it before and my search for guidance led me to the Riverford Farm Cookbook. Rosemary and garlic was suggested with cream and parmesan. I have substituted coconut cream (see below if you are unfamiliar with this ingredient) and added more parmesan. Serves 2 as a main course–4 as an accompanying vegetable. 160ml coconut cream—the difference between coconut milk/cream and cream of coconut is fully explained here: http://www.thekitchn.com/whats-the-difference-coconut-m-75446/. 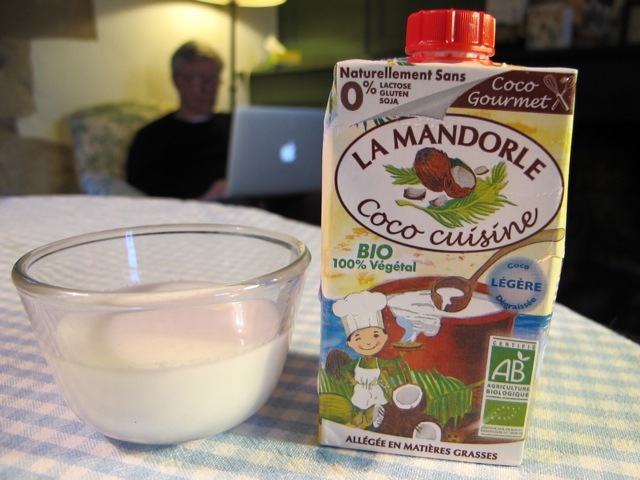 It looks like milk, it is NOT sweetened and it does NOT taste of coconut! 1/2 tablespoon parmesan to mix in with the cream+ more for the topping–a tablespoon perhaps. Bring the stock to the boil in a wide shallow pan. 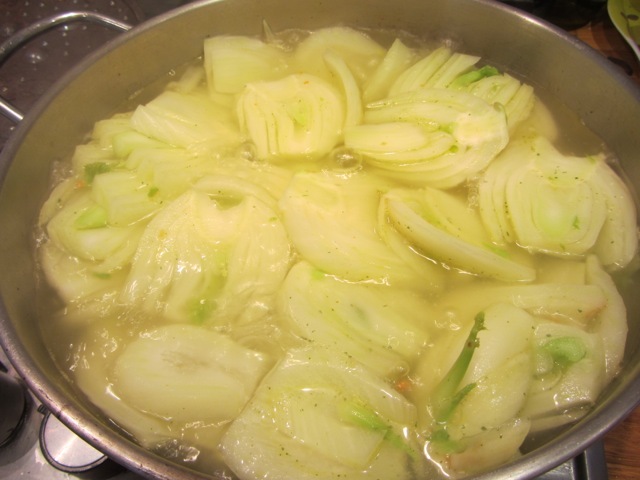 Add the fennel and cook for about 5 minutes–until it’s beginning to soften. Remove it to a bowl with a draining spoon and let it cool a little. This looks uncooked–but it is! 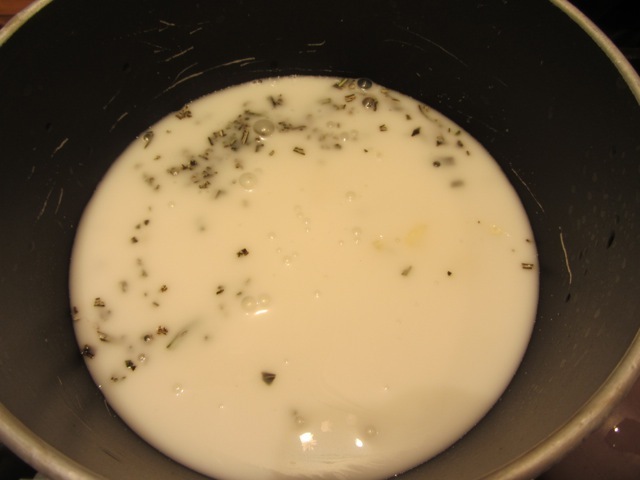 Combine the coconut cream with the garlic and rosemary in a small pan and gently bring to the boil. Season this mix and add half the cheese. Pour it on the fennel and turn it all over thoroughly. 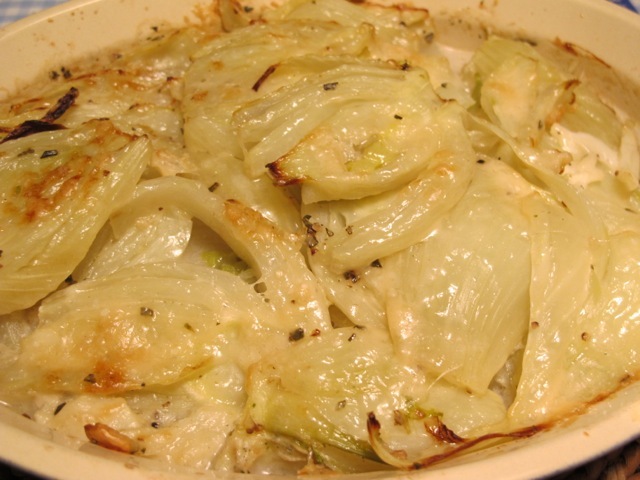 Put the gratin mix in an oven proof dish–it is oven-ready now. This can be prepared beforehand and set aside, covered with foil. Cook it in the oven for 30 minutes. Take it out and lift off the foil. Sprinkle over parmesan to cover and put it back uncovered in the oven for a further 15 minutes. It will have browned nicely on top. It’s one of our favorite company dishes. Even people who don’t like salmon like it:-) I also love fennel raw, just sliced with a little fresh lemon juice and good olive oil. You’ve inspired me to check out the supermarket this week! Nom! As we say here in New Zealand. Bought a tiny fennel plant yesterday so all I have to do is plant it, water it, weed around it and protect it for three or four months – and then we can do this with it! I am slightly confused, Robin. 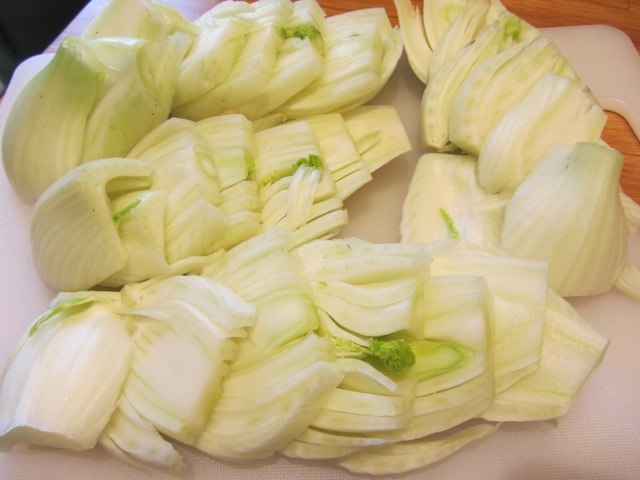 Caption for photo of fennel ‘this looks uncooked – but it is’ . Does that mean it is uncooked? Also, how much cheese did you use, please? But it is–I should have italicized is. I’ll go do it now–thanks. Parmesan: half a tablespoon to go in with the cream and an extra tablespoon for the topping. Thanks too Sophie-Jane for pointing this out. Meredith says it is still unclear! Sorry, my message suddenly disappeared before I had finished it. Whoops. I love fennel, but it is so expensive here. Must look out for the coconut cream too. Thank you for all your interesting ideas. This looks very interesting. First time I ever cooked with fennel was the result of your blog. Now I love it both raw and cooked. 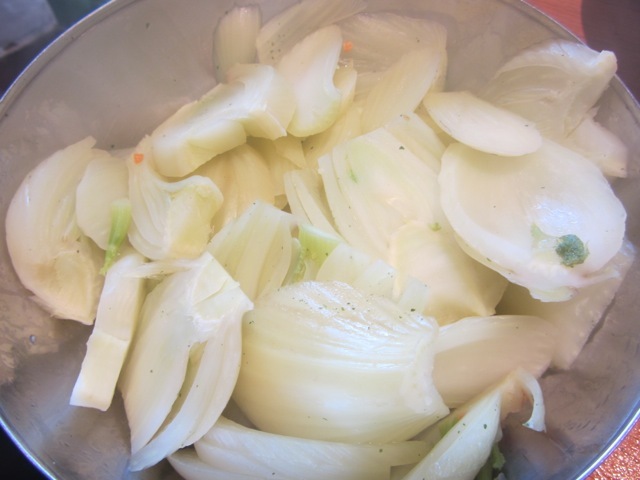 I love the fennel salad from the cooking workshop. Made it quite a few times since I have returned home. I will definitely try this one as it looks delicious. My menus would be so boring without you Robin! I have never cooked with fennel before but this has just inspired me to have a go at growing it and cooking with it. Thank you. Good point Rosemary. Sophie-Jane mentioned this below. I added the detail that was missing later yesterday. on November 28, 2012 at 1:53 am | Reply Dianne P.
This looks WONDERFUL, Robin–so creamy! Sounds like the perfect comfort food for the bit of snow we got today! Am copying this for a later date (and this week’s shopping list)! Yum!